Home > Therapy > How Competent is Your Therapist? Therapy is an important part of depression treatment for many people. It might go hand-in-hand with medication or it could be used with a range of alternative treatments. Most agree though that it can play a pivotal role in helping patients to recover from depression or manage it long-term to prevent a breakdown. But with all the elements to consider such as the type of therapy, should you question the competence of your therapist? According to a new study, the answer is a resounding yes – at least in the case of cognitive therapy for depression. In a recent study, it was found that depressed patients showed a more significant improvement in their symptoms if the therapist was shown as more competent. This competence was examined in terms of how closely the therapist followed the guidelines for using cognitive therapy. Another study finding was that this therapist competence could be the important key in the outcome for the patient as well. In this study, the more competent the therapist, the more the patients showed a reduction in depression symptoms. Researchers think this mostly applies to people who have major anxiety or a long history of depression, especially where it started at an early age. For those who have less intense and complicated depression, moderately skilled cognitive therapists can still help. Researchers used a tool called the Cognitive Therapy Scale. It is also used by an organisation that accredits cognitive therapists. The scale works by rating therapists on many different skills that are important to success as a cognitive therapist. 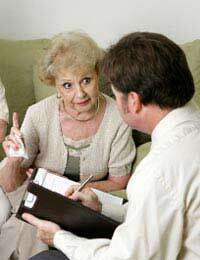 This includes skills relating to interpersonal relations as well as the many different techniques that are believed to help depressed patients. In this particular study, researchers rated the competence of the therapists during the first four sessions for sixty different patients. They also had patients fill out a survey that helped to measure their level of depression. To assess the effect of competence on depression, the researchers compared the competence scores with the depression levels they measured in patients. They found that the patients who had really high anxiety and depression showed the most benefit from the very competent therapists. Long-term results after a couple of months showed the same benefit but not quite as strong. It seems that early on in therapy is where patient outcomes are more strongly related to therapist competence. It may seem like the obvious choice when it comes to cognitive therapy – use a competent therapist. But there are many well-intentioned, qualified therapists who aren’t necessarily the highly competent, experienced ones we would expect. Such therapists can still do much to benefit depressed patients. If, however, you do have more complicated or severe depression, then it is probably wise to find out as much as possible about your therapist’s training and experience. Where patient outcomes have more at stake, this competence can make a big difference in helping a person to overcome depression.